LÄSSIG’s black car organizer offers space for everything children need on a car trip. The little ghosts that light up in the dark provide even more fun. 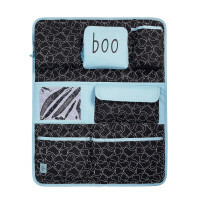 Product information "Car Wrap-to-Go, Spooky Black"
description & equipment Stress-free traveling for the whole family: LÄSSIG’s Car Wrap-to-go organizer is an ideal travel companion and practically indispensable for children and parents when traveling by car: Children have what they need at their finger tips, whether it’s a soft animal, drinking bottle, toy or snacks – everything fits into the numerous and practical storage pockets fitted with Velcro fasteners and zippers. It can easily be attached to the back of a car seat. The outer material is water-repellent so there’s no problem when anything spills. 'Glow in the dark” guarantees fun for the children: The special design effect of the Spooky collection’s 'glow in the dark” makes the little ghosts glow when exposed to light. 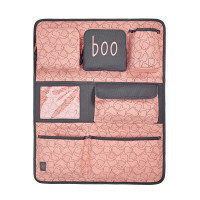 The Car Wrap-to-go organizer is available in the various designs of the individual children's collections.